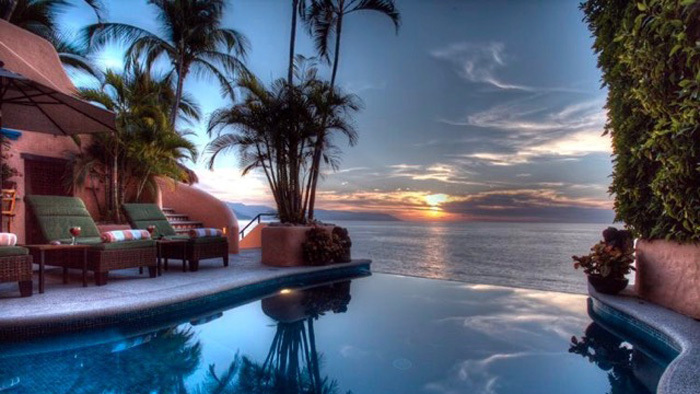 The International Friendship Club (IFC) offers tours of some of Vallarta’s most spectacular homes twice every week, beginning mid-November and continuing through March. The opportunity to take a peek into these villas has been wildly popular for many years. The IFC Home Tours depart on Tuesdays and Wednesdays at 10:30 am from the Sea Monkey Restaurant located on Los Muertos Beach at Aquiles Serdan St. in Colonia Emiliano Zapata. Using comfortable, air-conditioned buses, the tour makes stops at four architecturally unique homes set on rocky promontories overlooking Banderas Bay. Access to some homes may require a short walk on a cobbled street or climbing a few flights of stairs. However, you can prepare for this exertion with a breakfast or coffee at Sea Monkey before the tour begins, as the reception desk is open at 9 am on tour days. The tours finish in downtown at approximately 1 pm, and knowledgeable docents are prepared to answer all your questions throughout the outing with a smile. The cost of the tour is $500 pesos ($35 USD) and all proceeds, after paying the cost of the buses, is used by IFC to support its cleft palate program—a dental program in nearby South Shore community Boca de Tomatlán—as well as many local charities and social services. Reviews on Trip Advisor consistently rank the tours as either Excellent or Very Good. The first tour of this season will be on Tuesday, November 17. Tickets are available at the start of the tour or online at this link. Learn more about the International Friendship Club by visiting their website.